When you offer cleaning services to the world around you, you need an easy way to list the prices of those services. You want those who hire you to know just how much they are going to be paying you to get the job done, and this cleaning price list template will help you with that. This template will help you to create something that is easy to read and understand. 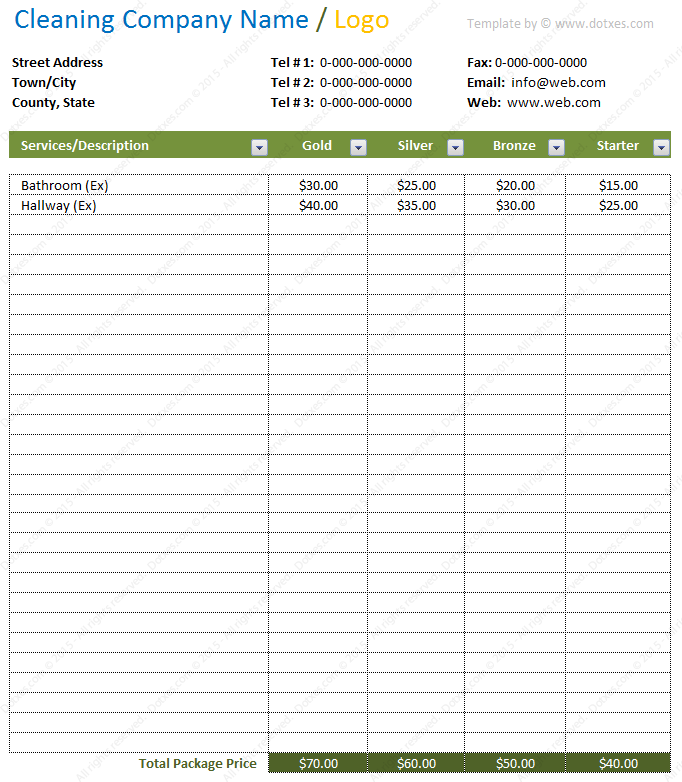 This cleaning price list template includes space for you to list the name of the cleaning company, the address of the company, and the services that are offered. This template was created in Microsoft Excel and it is set up in a way that is simple and clean, allowing you to maintain your cleaning price list in a perfect way. The template can be edited in Microsoft Excel 2007 and newer versions of the software. Through the help of the four categories that are listed on this template – gold, silver, bronze, and starter – you can list different prices for different levels of service quality that will be given. This makes it simple for you to share about your services and to offer them to your clients.